On this episode of the ProfitWell Report, Sarah Bedrick, Co-Founder and Head of Marketing at Compt, is curious to know if we have any data on how open offices impact subscription growth. Sarah, we have you covered. While open offices were around as early as the 1750s, they didn’t really gain popularity until the early 1900s when famous American architect Frank Lloyd Wright started to popularize them through his designs. Then, in the 1950s, the Burolandschaft movement out of Germany was pushed forward by Herman Miller’s action offices, considered the best way to design an office at the time. Now the thing to keep in mind here is that these open offices were not the open offices a lot of us have today. They were cathedrals with tons of nooks and crannies to balance the collaboration dream of open offices with the need for distraction free zones. Like most good ideas, we all then bastardized it with the IKEA rows of desks a lot of us work in today. I’m sure that was more office architecture knowledge than you wanted, so let’s get to the data. We studied just over one thousand subscription and SaaS companies who had teams that were co-located in the same location. Open offices didn’t impact overall growth as much as I thought it would. 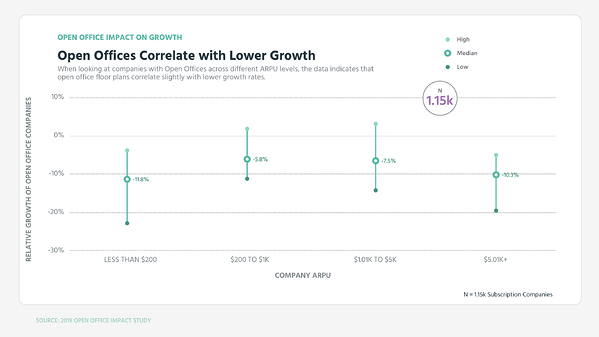 What you’re seeing here is the relative growth rate of open office environments compared to those who have closed offices or some arrangement for everyone to have their own space. 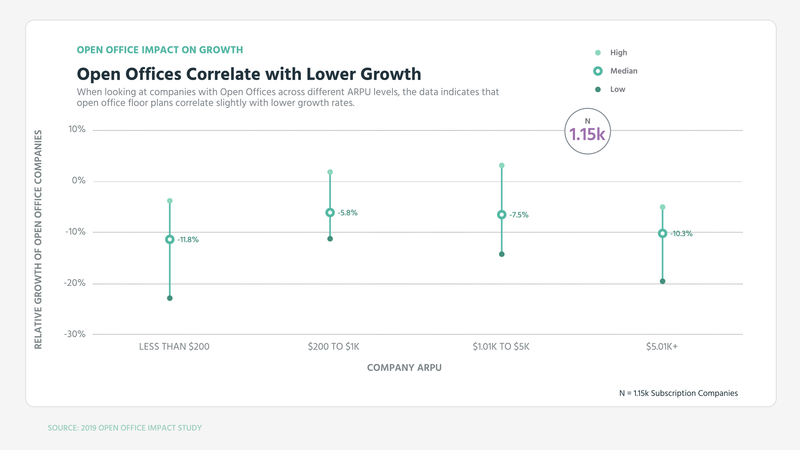 Notice how open offices at each of these ARPU levels only have show 6 to 12% lower growth on a relative basis compared to their closed office counterparts. Don’t get me wrong, I’ll always take an extra 10% when it comes to growth, but when you think of cost savings, maybe that 10% isn’t too bad of a loss. Here’s a fascinating finding though: Companies with open offices tend to have much worse gross churn than their closed office counterparts. 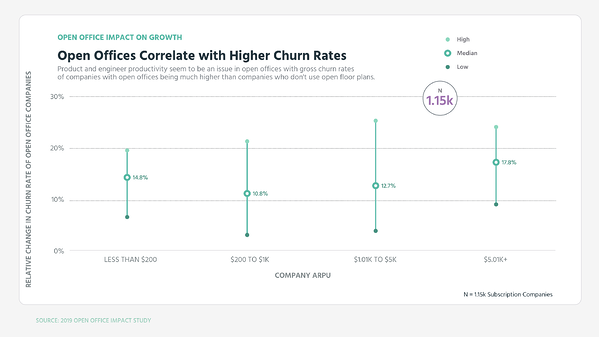 As you’ll see here, the data indicates that open offices have 11 to 18% higher gross churn rates than their closed office counterparts. What in the world is happening here? Well, my instinct tells me that this comes down to developer and product productivity. If you think about where a lot of growth comes from, you have elements of growth that are marketing and sales and elements of growth that are product. Yet, it’s relatively easy to turn up sales and marketing. Not easy, but comparatively easy. Turning these up can overcome churn problems and think about the bullpens of sales teams - they feed off of one another and the distraction is almost ok.
Churn always creeps up at some point, and gross churn is almost purely a product problem, so if your development and product teams are distracted, aren’t productive, or aren’t happy because of those things, you’re likely not going to have the ability to solve your churn. That being said, there are likely a lot of lurking variables here, so we probably shouldn’t take this as the nail in the coffin for open offices. More research needs to be done, but in the context of all the other research that’s been completed, focusing a bit more on distraction free product productivity is likely worthy of your focus.